Child fevers can be scary, but so can the side-effects of an over-the-counter child fever reducer! An herbal child fever remedy helps maintain a normal body temperature range naturally. 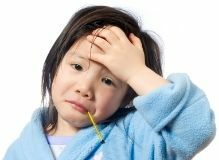 Assist your child's natural cooling process with natural fever remedies. They are safe, chemical-free and without the risk of harmful side-effects! An increase in body temperature is the body's natural way of fighting off illness and infection and is something every child will experience at some point. Managing a child's fever is important, however the cause of the fever should always be diagnosed and treated as soon as possible. In most cases a fever is caused by an underlying illness or infection. As the immune system fights off infection, it generates heat, which results in increased body temperature. This raised body temperature assists the immune system in ridding the body of illness as viruses and bacteria generally cannot withstand high temperature. Treating a fever in a child depends on the underlying cause as well as the severity of the fever. There are a number of over-the-counter fever reducer medications including acetaminophen, ibuprofen and aspirin. It is important that aspirin is never given to children, as it can cause serious side-effects including the potentially fatal Reyes syndrome. Natural fever remedies can reduce a fever naturally, without risks associated with over-the-counter fever reducer medications. Natural herbs like Yarrow and Meadowsweet have long histories as natural fever remedies. Another beneficial herbal fever reducer used as a child fever remedy is Passiflora incarnate which helps ease irritability, anxiety and pain, while promoting sleep. For a homeopathic alternative to reduce child fevers without side-effects, choose an herbal fever reducer. A child fever remedy is an herbal fever reducer that supports a normal body temperature, without harmful side-effects!